Former Libyan rebels securing a street in Libya’s desert city of Kufra. Tunisia’s main border crossing with Libya was closed after clashes between Libyan armed forces and former rebels over control of the frontier, security sources said yesterday. At the same time Libya also announced that elections for a constituent assembly, the country’s first national vote after four decades of dictatorship under toppled leader Muammar Gaddafi, has been postponed to July 7. The election had originally been slated to be held by June 19. “The date for the elections will be July 7,” the president of the electoral commission, Nuri al-Abbar, told a news conference in Tripoli, citing “logistical and technical” reasons for the delay. The vote was postponed due to a delay in adopting a law to organise the elections, in order to give voters more time to register and to allow candidates who have been ruled out by the commission to appeal the decision, Mr Abbar said. Meanwhile, the border clashes broke out on Saturday night when Libyan soldiers tried to take control of the Ras Jdir border post from former rebels, news agency TAP said. “The main road has been closed on the Libyan side as a preventive security measure” with only urgent convoys and ambulances allowed to pass, the sources said. The border was also blocked on the Tunisian side by demonstrators calling for the liberation of 12 Tunisians who had been arrested during clashes on the Libyan side and prevented from returning to their home country, TAP said. Long queues of vehicles carrying Libyan passengers were massed at the border, unable to cross back home. Ras Jdir is the main border crossing between the two countries. Meanwhile Members of Libya’s Toubou minority and government forces fought for a second consecutive day yesterday, with the death toll rising to 23, tribal sources and a local military commander said. Dr Taher Wehli said 20 members of his Toubou community, including women and children, were killed since fighting erupted in Kufra on Saturday, with more than 50 other people wounded. 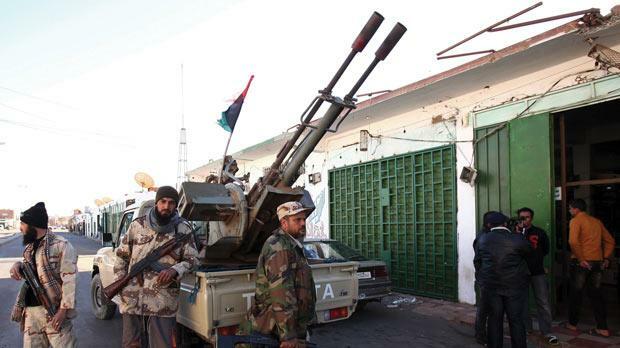 Wissam Ben Hmid, commander of the Libya Shield Brigade which is stationed in the southern oasis city, said he had lost three of his men in fighting sparked by a Toubou attack on one of their checkpoints. He said 12 others member of the brigade – former rebels under government control who were sent to quell previous ethnic fighting – were wounded during clashes. But tribal chief Issa Abdelmajid gave a higher toll, saying 28 people were killed in two days of fighting.